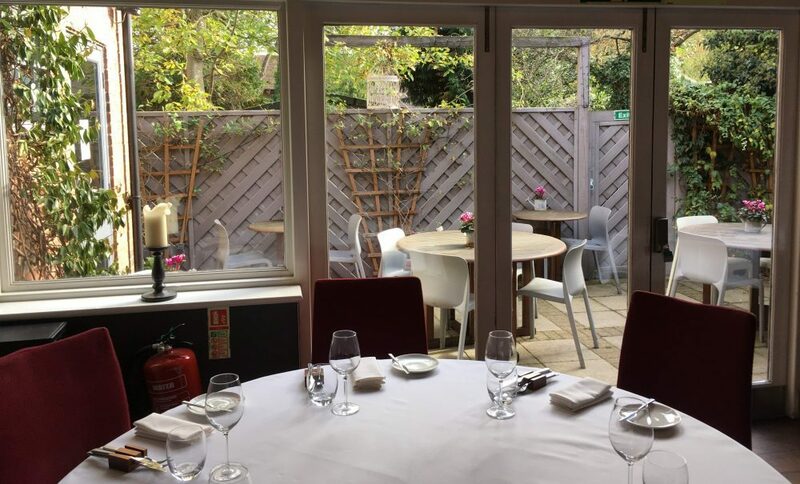 With two set menus under my belt, one by day and one by night, I’m ready to spill the (tonka) beans about Thompson St Albans. 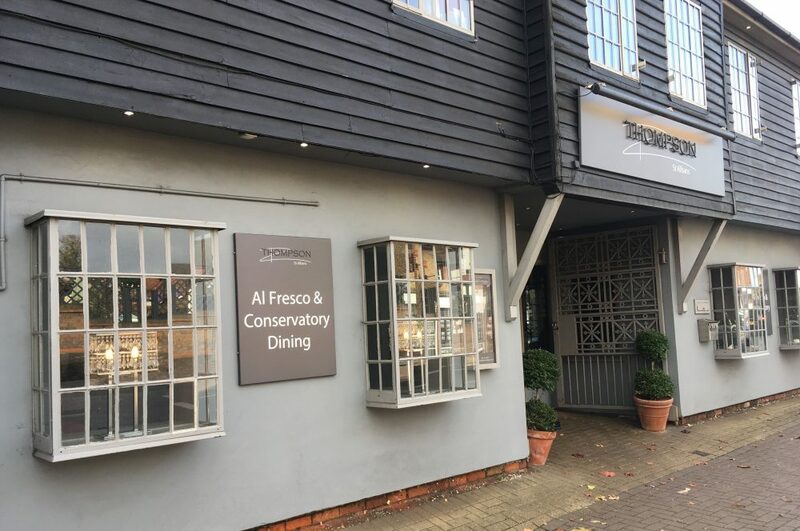 In the not-quite city centre stands this stylish, understated building on Hatfield Road, a brisk 10-minute walk from St Albans railway station and a minute or two from St Peter’s churchyard, with its sculptures and thoughtfully designed areas of calm. My guess is that many of you will know the Thompson St Albans building, and I have walked and driven past it a gazillion times, but if you’re like me, you may not have eaten there. The reason? Well, mine is because I probably thought it was a bit fancy; best reserved for special occasions. A bit dressy uppy, perhaps. Certainly not for a midweek, can’t be bothered to cook evening. How wrong I was. The gates are open, step inside. My first visit is to sample the midweek set dinner menu, and my friend Natasha, restaurant designer and founder of Social Fabric, catches the train in from Walthamstow. She describes the atmosphere as ‘convivial, with formality’. Interesting. 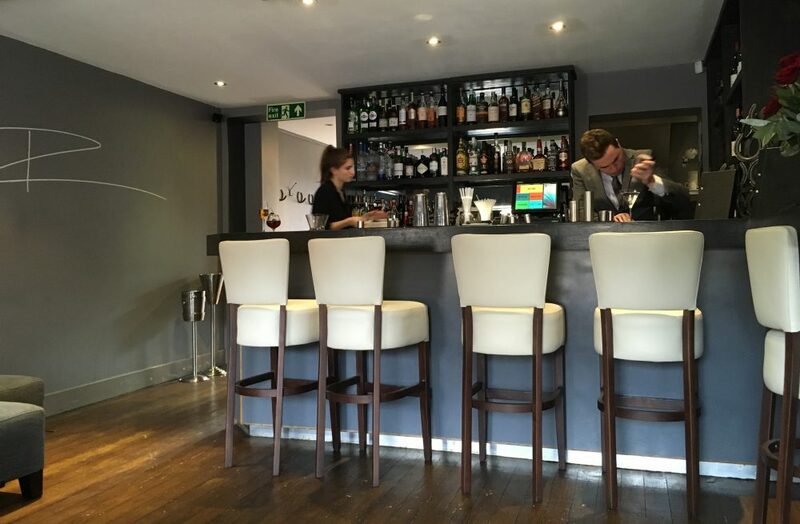 We discuss this, and agree that the way we are greeted and invited to have a drink in the bar demonstrates a certain respect for the formality of the ritual of going out to enjoy food. The team here are professional but with a friendliness that is completely natural. Their approach and the atmosphere are conducive to both of us shrugging off any stresses and preoccupations and enjoying that lovely feeling of relaxation and all being well in the world. There’s your conviviality. I think that Thompson St Albans is often described as a venue for ‘fine dining’, but for me, this label can give the wrong impression. For starters, Thompson St Albans is not in the least bit stuffy or starchy. The only starch you will find here is in the napkins. The interior is calm, with a slightly sober colour palette of aubergine with cherry red or why not call it claret, depending on your eyesight and the light on the day. There are dark floorboards in the bar and conservatory, and grey carpet in the dining room at the front. There is more seating upstairs. 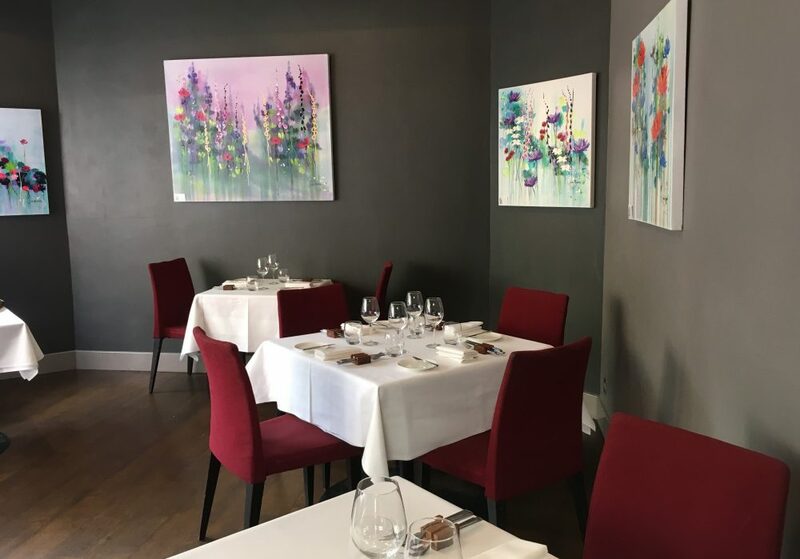 Jazzing things up considerably with bright splashes on the walls – I say grey, and Natasha says olive, but that’s designers for you – are paintings from a local Tewin artist, Judy Bywater. Come spring, the conservatory opens onto the terrace, and I’ve already been invited to go back and review next year, so I’ll keep you posted. I’m basing this review on my second visit, when I lunch alone, and work my way through three courses from the set menu. 2 courses: £18.50; 3 courses: £23.00. I’ve just come back from a few days in Cornwall, and my beady eyes alight on the Cornish elements on the menu. Yes! I’m back in Newlyn! It’s going to be fish all the way. First up is Cornish mackerel, with apple and lemon mayonnaise. Look how pretty it is! The mackerel is rich and in large flakes, flecked with herbs. The blobs of lemon mayonnaise are refreshing. 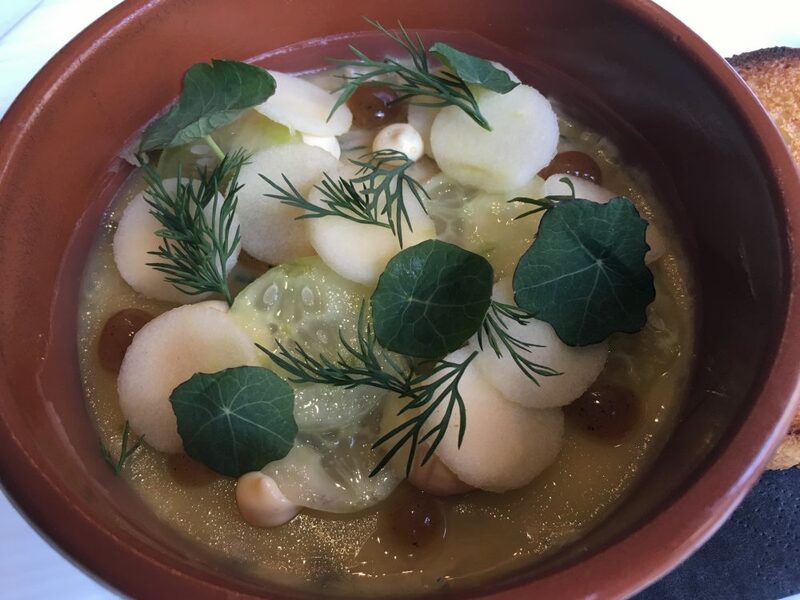 There are also dots of a burnt lemon gel and sweet discs of Granny Smiths and cucumber. A few fronds of dill, and mini nasturtium leaves. The slice of toast is dainty and delicious, and when I ask for more, two hot slices arrive, tucked up in a (starched) napkin hospital bed. Oh, and there are herb bread rolls – puffed perfection studded with black onion seeds and chives – with whipped (what else?) butter. I’ve also got a glass of Muscadet which has been recommended by James. There are two front of house Jameses. Both are excellent. This is a sublime starter. It’s refreshing: the apple and lemon are tangy and the perfect foil for the unctuous chunks of mackerel. I taste everything on its own – who knew that nasturtium leaves could taste so good? I’ve got nasturtium in my garden but have never used it in the kitchen, partly because the leaves are scarily gigantic. These are delicate and peppery. Every single element is packed with taste and texture and together the whole thing is a delight. My main course arrives. It’s beautiful to look at. This is perfect autumn food: zingy colours and interesting textures. The fish has a tangle of pickled squash which is pleasingly tart, and as I crunch the pumpkin seeds I can feel my magnesium levels on the up. Must eat more seeds! The fish is perfect: crisp skin on firm, buttery flesh. This works brilliantly with butternut squash that has been crushed to leave chunks for added texture, rather than pureed. I’ve also got red sorrel leaves, again with a great taste, and a verjus dressing, which I think can be made with either ripe grapes or crab apple. I think it’s crab apple, although I could be wrong. I’m enjoying myself a lot. You can taste the thought and creativity that’s gone into this food. Oh, and I order extra veg: cumin roasted carrots with orange, and thyme cabbage which looks bit like paper that’s gone through an office shredder, all zig-zaggy. Oh my goodness, it’s delicious! On my first visit, we had the duck fat roast potatoes, and the carrots make me have greedy roast potato thoughts. I’m already planning on a return visit, perhaps for Sunday lunch. From where I’m sitting, I can also see what’s going on in the kitchen. It seems quite calm: Team Thompson seem to enjoying themselves. It comes over in the cooking. Pudding. Praise be that I can manage one. I’m still on the set menu, which by the way changes every single day, and I’m choosing between glazed lemon tart with verbena ice cream and honey beurre blanc and whipped tonka bean cream with figs poached in port, oat granola and orange ice cream. I think I should try the verbena ice cream. I have some very straggly, end of season verbena in my garden that really doesn’t look very appetising so what could it taste like in ice cream? In the end I plump for the tonka bean because I remember Tonka toys and I’ve certainly never tasted a tonka bean and there’s no time like the present. And I’ve made the right choice. The first mouthful slows me right down because it’s a really interesting flavour. The tonka, that is. A bit vanilla-y, and perfumed. I once went to Belize to write an article about Green & Black’s Maya Gold chocolate and I was lucky enough to spend a week with cacao farmers. If you cut open a cacao pod with a machete, the flesh has something of aroma of the tonka bean. I know that now. This is a pudding that I could happily eat once a week, possibly forever. It’s a marvel of combos, and looks beautiful. 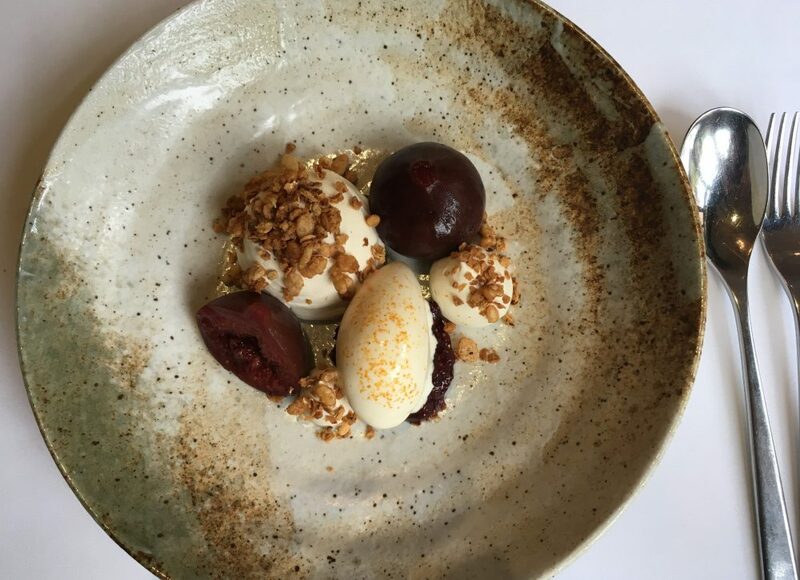 The cream has an utterly gorgeous texture and flavour, and then you’ve got a kind of rice crispie (but more robust) popping thing with the granola, and an intensely jammy fig and honey compote underpinning the ice cream. The ice cream is zesty and sweet all at the same time, speckled with grated orange dust. The figs…well, hopefully you can see from this pic how plumped with port they are. Rivulets from the port and figs run into the ice cream and tonka cream and even halfway through demolishing it, the pudding still looks gorgeous. As for my taste buds, they’re doing a yogic happy baby pose. I could happily revisit this pudding on a very regular basis. And is this really a set lunch? 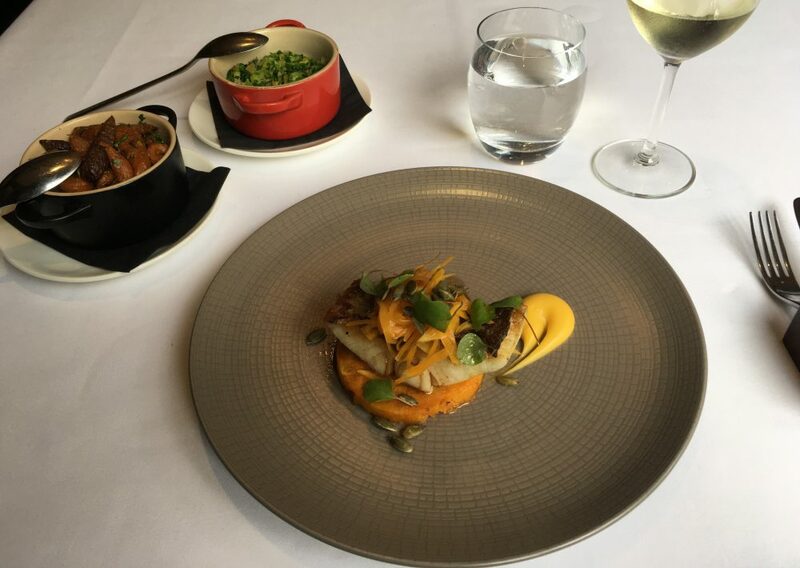 Three courses for £23.00? Are you kidding me? Could someone please give this man a medal? Oh, actually, someone just has. 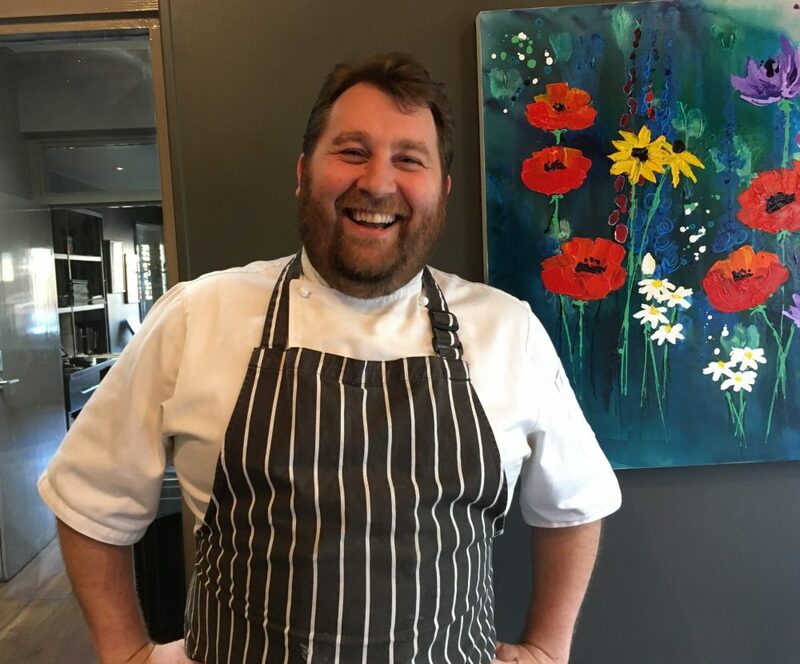 Phil Thompson and his team have just garnered three – yes, that’s THREE AA Rosettes. Very well deserved. While I’ve still got a smile on my face from the tonka bean cream dream, Phil is kind enough to join me, and he brings along a plate of petits fours. It goes without saying that I get stuck in immediately. As I’m saying goodbye to Phil, I grab the macaron and stuff it in my bag for later. No shame. Phil doesn’t seem to mind. He’s probably pleased. Phil hales from Dagenham in Essex, and he comes from a cooking family, and learned a lot from his Uncle Mick, back in the day. He’s since learned from and worked with the great and the good, including Paul Gayler at The Lanesborough, Chris Galvin at L’Orrery and Marco Pierre White at L’Escargot. He moved to Hertfordshire to work at Auberge du Lac at Brocket Hall, where he won two Michelin stars and became Executive Chef. Andrei Lussmann is a great fan and when I interviewed him (Andrei) he called Phil Thompson a ‘top chap’ and said that it was only a matter of time before he gets a Michelin star. Phil is completely unstarry and extremely modest. He talks about the ‘brigade’ – his team in the kitchen and front of house. When he talks about the ingredients, whether it’s the cress being grown at Carpenter’s down the road in Sandridge, the produce in his (soon-to-be) father-in-law’s allotment, or the beef from Bridget B’s in Watton at Stone, his eyes shine and he smiles a lot. This man loves food. More than that, he loves to create food that people enjoy. This is his first restaurant and he’s coming up to its fourth birthday at the beginning of November. We talk about awards and whether it’s important to be on the gastronomic map. ‘All I want is for people to come here and enjoy the food,’ he says. He’s very open and big hearted I think, and he talks about how he likes being able to give his team some time off – they’re closed from Sunday evening to Tuesday lunchtime; open for evening service on Tuesday – because it means they are able to rest and recover and remain fresh and enthusiastic. I like him immensely and I understand what makes eating here feel special: everything comes from a good place. 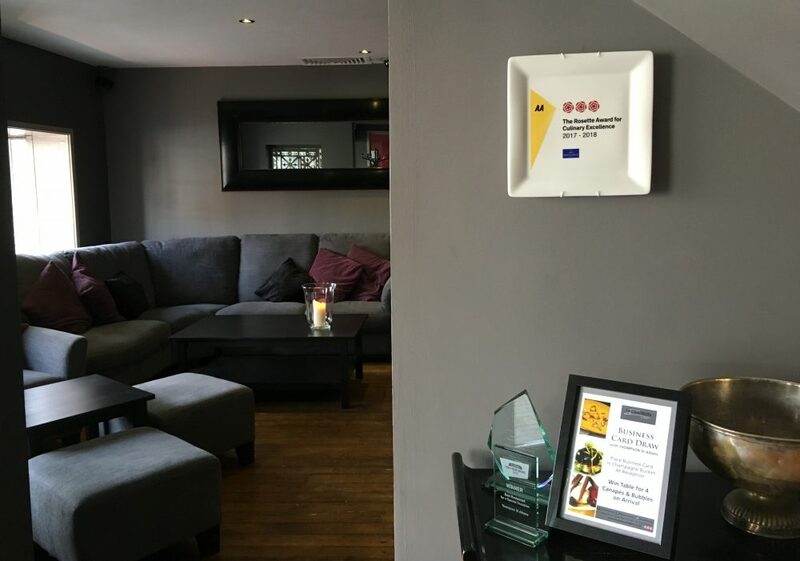 The three AA rosettes means that Thompson St Albans is now in the top ten percent of UK restaurants. There’s a feeling of commitment and cohesion that everyone is working toward the same goal led by Phil: to give people an enjoyable and memorable experience so that they will want to come back. Top chap, indeed! Surprisingly, yes, very. Obviously you might not want to bring very young children here in the evening, but during the day, I think they’d love it. One of the Jameses tells me that recently a group of mothers came in for lunch, with buggies. James settled everyone in, choosing the conservatory, and he even moved a table to create a temporary pram park. Let’s just say that looking after people here is paramount. And just to give you a taste of the children’s menu: classic prawn cocktail, crispy chicken, buttered sweetcorn and sweet potato wedges. A good choice of suitably innocent cocktails that feel very treaty. The puddings make me wonder why these don’t make their way onto the adult menu: DIY ice cream cones; a jar of home made sweets. Really, they’ve thought of everything. 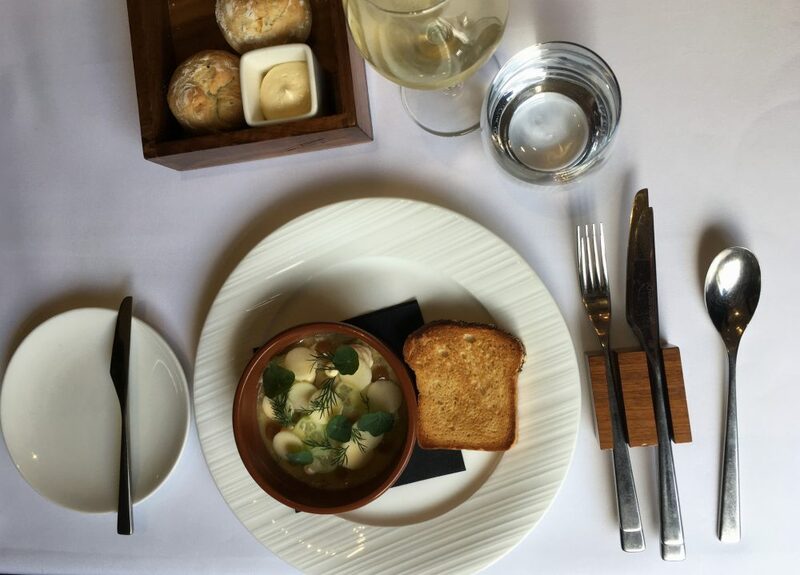 2 courses: £12.50. Good for: Anyone who appreciates wonderfully creative and delicious food in a relaxed environment. I ate every mouthful thinking that it had been sourced, prepared and cooked by people who really care. The attention to detail comes across in everything: from the welcome, to how you are looked after while you are there, and the fact that every single element of the experience has been thought about. The midweek set menus are astounding in value and outstanding in quality. I’m going back for a Sunday roast. 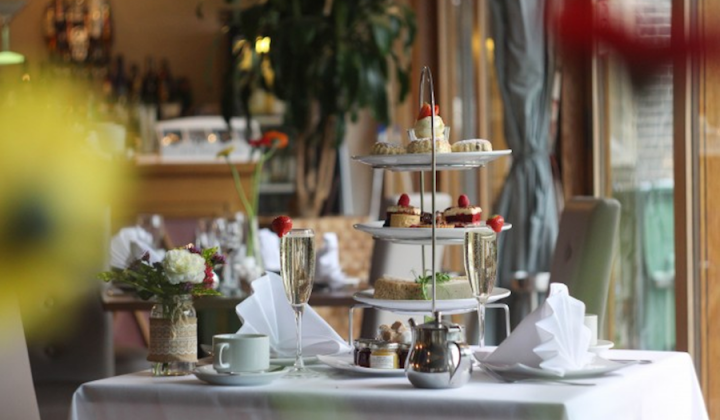 And yes, Thompson St Albans is of course perfect for special occasions. I think we are extremely lucky to have Thompson St Albans in Hertfordshire. Not for: This is a city restaurant, so if you want views of rolling hills and sweeping vistas, you won’t get them here. However, if you have the time, I would have a mooch in St Peter’s ‘living’ churchyard, and of course St Albans Cathedral and gardens are less than ten minutes’ walk. The damage: Astonishingly good value. This is an experience that feels generous and all-round wonderful. Service is fantastic: attentive and professional but without all the fussing and faux formality. They’ve got it just right. 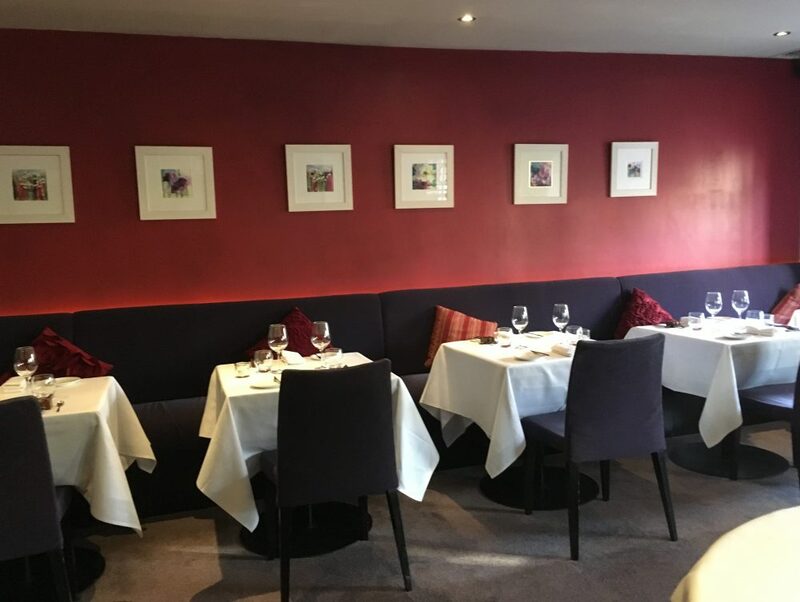 I’ve now experienced both the midweek set menus, and yes, you could easily come here in the evening if you don’t want to cook, and have two courses for £21. 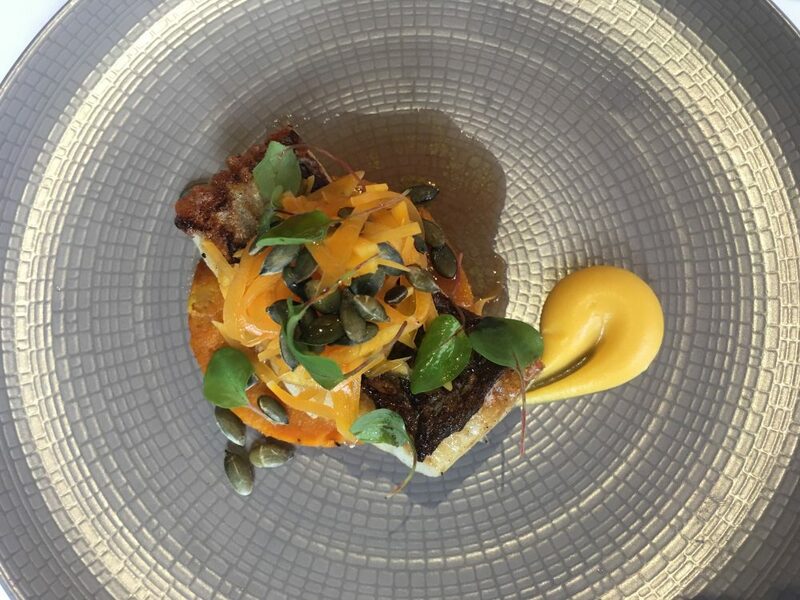 The set lunch menu is £18.50 for 2 courses; £23.00 for 3 courses. And then of course you can scale up: the tasting menu is £59. Sunday lunch is £25 for two courses; 29.50 for three.